Getting in the news is as important as the project itself. Why for a number of reasons but one of the reasons is to get the word out about your project and to find possible additional support for it. It also helps the community involved in the project take even more possession of their creation and their community. There is something psychological that happens when one reads the paper about their community and about making something that will help beautify their school, church, town or city. After the projects were completed students and educators were asked a series of questions about the projects. The Following are comments from participating students. Do you feel like the projects inspired you? "Yea, it was a new way of looking at environmentally Friendly Art." "Yes, I really liked the recycled caps idea, it gives a good message about recycling." Did the project help unite students to one another? to adults? "Yes, the whole school lent a hand in making the project. It was an awesome experience." "Yes, everyone had to work together to get the projects finished. You had to trust the other people working on the project." What did you learn by working on the Masterpiece Art Kits? Were the kits a good tool for teaching? "There are lots of different art mediums. They were a good teaching tool they taught us about a different medium and that art can be big!" "I think the kits are a great way of introducing fine art tools into a school setting." "I wouldn't say teaching. I would say a guide. But as a guide it was excellent!" Would you recommend one of the Masterpiece Art Kits to other high schools or junior high? Approximately how many students worked on the projects? Ms. Squires: "The Entire School (1600 students) collected caps, All of my students (150) helped wash, sort, dry, clean glue off of the caps. 20-30 students worked on the mural making, 5-10 students helped with installation process." Do You feel this was a successful project for your students? For your school? Ms. Squires: "This project was a huge hit with all students - even if they were not directly involved, they were asking all semester in the hallway - 'What is it?' The administrative staff and teachers also live the murals we have gotten many compliments on them." What did the students learn by working on the Masterpiece Art Kits? Were the kits a good tool for teaching? Ms. Squires: "Students directly involved learned teamwork and job delegation. They also learned how to set attainable goals (today we need to finish this much, etc.) in order to reach the overall deadline. They learned about optical mixing , and about pointillism. Also, they learned that you really truly could make art out of anything. All year, I had kids telling me - "I saw the best color bottle cap on ____(fill in the product)." Do you feel like the projects inspired the participants? Ms. Squires: "Yes the students who were directly involved were very excited about the project. Almost all of the work was completed after school hours and on Saturdays; this shows the dedication that the students felt. We spent 60-70 hours after school on this project; they would not have worked this hard of they were not inspired." How did the developer of the project (David Heatwole) do helping with the project? 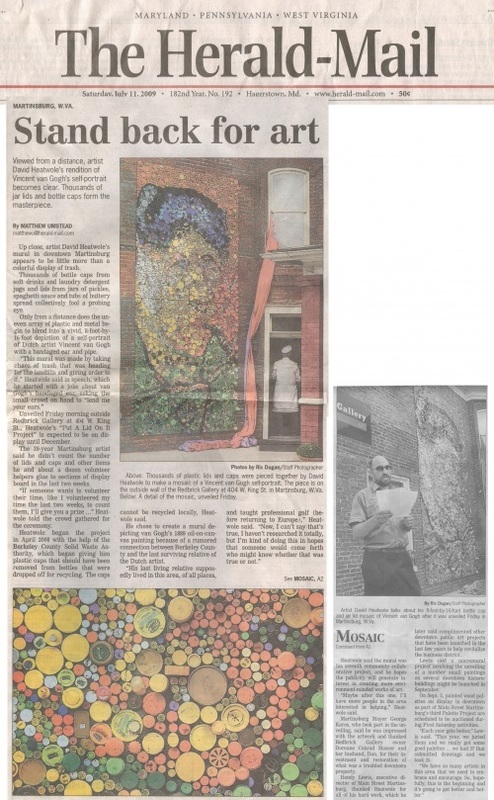 Ms. Squires: "David was very accessible to the group during the creation of the murals. I sent him pictures of our progress, and he responded quickly with feedback, instructions, and general support. David's help during the installation process was crucial. 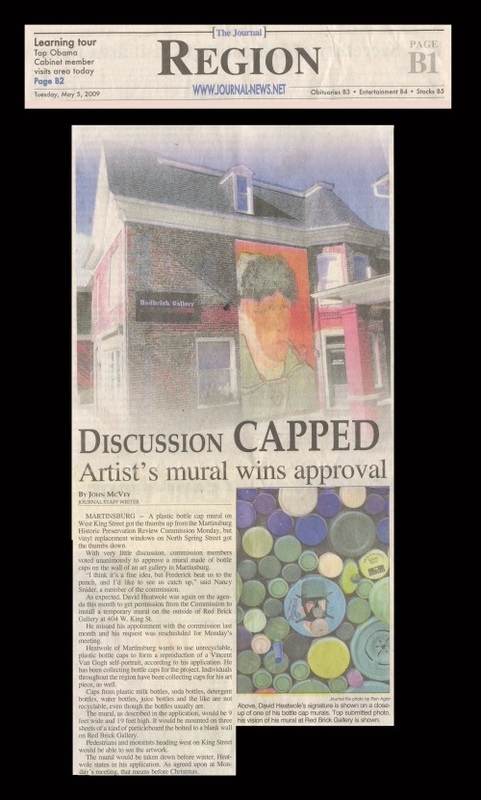 The murals would not be hanging up right now if he hadn't come in to help us with that part of the project." Here are some other facts as stated from the teacher to the organization that gave them a grant to help purchase their kits. "The artworks selected for this project were "The Son of Man" by Belgian Surrealist Rene Magritte, and "Basket of Apples" by Paul Cezanne. These works were selected because they both include apples, and Musselman High School is "The Home of the Apple." "Members of the National Art Honor Society (NAHS) helped raise funds for supplies by face painting at local events and at home football games, they also took family portraits for faculty and staff of Musselman High School at Christmas."